I got a gift called Earbags for the holidays this year not overly sure of the things. Someone knew I am wasn't a huge fan of hats outdoors when I am going places and Ear Muffs are way to bulky to put in your pockets. Anyways back to the Earbags... now if you are one that enjoys the cold weather outdoors in the snow, these might be right up your alley. 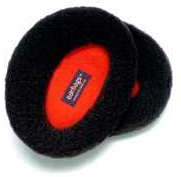 They simply slip over your ears and for the most part work really well. They are designed to allow you to still hear things so they are great if you work construction in the winter months outdoors. Check them out for yourself at the Earbags website. I am proud to announce that I have partnered up with Virtual Partners to offer AutoCAD training in the areas of both General and Customization/Programming. The schedule will change with demands on classes, but we have slotted classes from January through February. These classes range from customizing AutoCAD, using AutoLISP and VBA to great automation and improving work flow to general AutoCAD upgrade classes. If you have any questions please contact James Murphy at [email protected] or myself at [email protected]. Class schedule and information can be found on the Virtual Partners website. Contact us today to learn how to unlock the secrets and benefits of customizing AutoCAD; education is a great tool so start the New Year off on the right foot. I know it was a exciting couple of days of traveling between families and very enjoyable. To you and your loved ones have a safe and happy holidays whether you are traveling or not. May the New Year bring happiness and good health. The course handouts have been posted to the AU site so for those that did attend AU this year in Las Vegas watch your e-mail inbox closely. The link below will take you to the AU 2004 site for the Course Handouts. Please don't ask me for the password. How to see those that attened this year and hope to see many more of you there at the Walt Disney World Swan and Dolphin in Orlando. Tracy Lincoln has launched a CAD Blog. Tracy plays a large role everyday in the Autodesk Newsgroups helping users out. I'm sure Tracy will have plenty to share, once the Blog really gets rolling. Check out Tracy's Blog TLConsulting at http://tlconsulting.blogspot.com/. Just a couple of days ago I reposted the General AutoCAD Quick Guide. It included things like used Command Aliases, Accelerated Keys (Keyboard Shortcuts), Coordinate System (Types of Point Entry), Drag 'n Droppable files, Object Snaps and Selection Methods. Due to some reworking on my site and based on the huge number of downloads that the AutoCAD Quick Guide is getting; I decided to make available for the first time a version of the Quick Guide for AutoCAD LT 2005 users. There are no other versions available at this time for AutoCAD LT, but hope to make some older versions available at a future date. Thanks to those that have sent me comments about the AutoCAD 2005 version of the Quick Guide. The December issue of AUGI HotNews is just bursting at the seams with articles. The articles cover Autodesk University, the Top DAUG competition at AU, Customization and much more. Find out more about the AU event... AUGI even has posted a slide show on their site and noted some of the highlights during the event. Who's the 2005 Top DAUG? Congrats David Harrington for reaching First Place, check out who else made the Top 10 list for this years event. I have been spending a create deal of time working on my website and getting things just so. Well with most application development a lot of time is spent making sure it functions on a variety of desktops and in this case Web Browsers. While testing my site I have noticed a couple things that stand out among the different browsers. The browsers that I looked at were the latest versions of Microsoft IE, Nescape, Mozilla FireFox and Opera. The things that I noticed that didn't work consistently between the different browsers were table layouts, especially using percentage vs. pixel size and the borders. There might be other slight differences, but these are the ones that stood out right away to me. This is more of an FYI for those that might be new to web development; just because it looks good on one it might not look good on another. I did notice that IE and Opera displayed pages in a very similar fashion while Netscape and Mozilla displayed pages in a very similar fashion. These are the four standard browsers that I test against and happy web development. So what are Quick Guides you might be asking? Typically, Quick Guides are focused on a specific topic and deliver a quick shot of information and might be enough for a general overview at times of some features. They might also be references that are able to get you up and running very quickly with new features or even old ones that might have been forgotten. I have been publishing a variety of Quick Guides for many years and releases now. Quick Guides are great if you teach AutoCAD classes to new students. One of the Quick Guides that I have is for many of the commonly used Command Aliases, Accelerated Keys (Keyboard Shortcuts), Coordinate System (Types of Point Entry), Drag 'n Droppable files, Object Snaps and Selection Methods. Need an older version... we might have you covered with Quick Guides going back as far as R14 and through 2004. To view the many other Quick Guides click here. Have any ideas or suggestions for information you would like to see covered in a future Quick Guide send me at e-mail at [email protected].